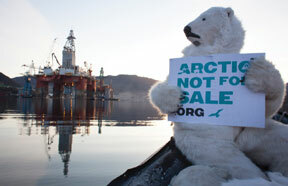 You Are Here: Home » Local News » Why is President Obama allowing Shell Oil to drill in the Arctic Ocean? Why is President Obama allowing Shell Oil to drill in the Arctic Ocean? In an impassioned article last week, I pointed out that President Obama’s devastating decision allowing Shell to drill in the Arctic Ocean runs so far counter to his environmental policy that it is important for us to know what’s behind it. With-in a day I found some answers that are so chilling I’ve been striving to put the subject completely out of my mind. But what is a citizen in a democracy if not one who will participate in the civic and political life to create the ideal she sees? As someone who knows from traveling the National Parks how much blood, sweat and tears has been invested in the development of our country to get us here, I owe my 13-month old grandson the courage to take action. “There’s more to Obama’s Arctic trip than just hypocrisy: Critics of the president’s Alaska visit should examine the National Petroleum Council’s role in pushing drilling“… Although such criticism has a point, it misses the force behind the decision to approve Arctic drilling to begin with: the National Petroleum Council (NPC) Obama’s ad-ministration oversees. “In October 2013, Secretary of Energy Ernest Moniz re-quested that the NPC do a study on the potential for Arctic drilling. A year and half later the NPC’s Artic drilling study committee – chaired by ExxonMobil CEO Rex Tillerson – not only published a pro-drilling report titled, ‘Arctic Potential: Realizing the Promise of U.S. Arctic Oil and Gas Resources,’ but al-so created an entire website and social media campaign around its release. Say what? I didn’t know about the NPC, though I consider myself an informed citizen. I cannot blame the group for the President’s decision, but I do find it very chilling that a group of people who’ve have an overwhelming vested interest in the exploitation of our commonly held resources have so much power in a decision that could destabilize our planet. “When President Barack Obama on Wednesday (9/3/2025) becomes the first sit-ting U.S. president to set foot above the Arctic Circle, he will enter a vast territory under-going a historic and rapid transformation. Climate change, resource competition and renewed Russian military interest threaten to turn a place marked by cooperation in the decades since the Cold War into a zone of contention. “As the sea ice recedes, Arctic waters, including the Chukchi and Beaufort seas, are becoming more navigable than at any time in the known past. Yet in the race to stake claims in this newly accessible region, Russia is far ahead of the rest. “…. the Arctic is beginning to become militarized, and there is no forum or place to discuss security-related issues and to promote greater transparency and confidence,” said a report, ‘The New Ice Curtain,’ released in August by the Center for Strategic and International Studies, a think tank based in Washington, D.C. Whew!! I could be my own fault that I knew only vaguely of this issue and had no idea that so much is in play. I erred last week in saying we worked 20 years to keep drilling out of the Arctic, as it was specifically the Arctic National Wildlife Refuge that we fought the Bush administration tooth and nail to prevent drilling. Drilling has been going on in the Arctic for a long time, except that now we know the true cost as an accelerant of climate change. I don’t know what’s to blame that these vital issues are not front and center in American discourse. But it does strike me that as a society we are tilting at windmills while ignoring the real monsters in our midst. (Audrey Peterman is an environmentalist and writer living in Fort Lauderdale. Audrey@legacyontheland.com).